This Hurricane plan and emergency procedures describe the actions expected of each employee in the event of a tropical storm/or hurricane to ensure the safety of marina staff, patrons and property. The marina’s primary concern is the safety of persons. All decisions reflect this ethic. Examine dock cleats, pilings and whalers. All piling guides checked for tightness and rollers are in good working condition. Examine electrical and water connection under all dock ramps. Check breakwater lumber supports and fasteners. Examine, test run all emergency pumps, hoses and connections. Inventory all spill control equipment. Stage Two begins when a weather pattern is elevated to tropical storm status and poses possible danger to Central Florida. 1. Information is taken from the National Weather Service, American Red Cross, and Seminole County Emergency Response Unit. 2. Plan Coordinator updates marina staff. 3. Within 4-6 days of predicted landfall, Plan Coordinator directs staff to enact General Hurricane Protocol. 4. Within 3-5 days of predicted landfall, Plan Coordinator makes decision whether or not to evacuate the marina. Staff follows specific procedures and action steps to ensure an orderly and safe marina environment. For example, make sure all docks and finger piers are free from supplies and materials. Check all dock boxes for flammable liquids, thinners, etc. Notify boat owner of such and have them removed from property. Inspect boats for loose gear, bimini tops and portable fuel tanks. Inspect dock line condition and fenders and notify owner if not adequately secured. In case of a tropical storm or hurricane or other Acts of God, Vessel Owner may not assume that the marina will be safe, sheltered anchorage. In case of an impending tropical storm or hurricane or other calamity, MHM, in its sole discretion, is authorized to do whatever deems appropriate and reserves the right to move the vessel at the Vessel Owner’s risk and expense. Undertaking to move the vessel will not be deemed an assumption or responsibility for the safety, security and care of the vessel by MHM, nor will MHM be deemed a bailee of the Vessel Owner. Determine if you will trailer or haul your boat, secure it in the marina, or move to a previously identified hurricane mooring. Allow sufficient time in your plan to strip your boat of all movable objects (canvas, sails, dinghies, radios, cushions, etc.). Lash down everything you cannot remove. Practice your plan to see how long it takes to implement. At least one other person should know your hurricane plan in case you are out of town when the storm threatens. Move boat from marina property. Avoid exposure to the wind and park away from trees. Lash the boat to the trailer and secure the boat with heavy lines to a fixed object, preferable from four directions. Remove half the air from the tires. Block the tires to prevent rolling. Remove sails, rigging, and other loose objects. Double all lines and protect them from chafing. Make sure boat will not strike roof as water levels rise. Make sure that cleats are well secured to the boat. Where possible secure lines to pilings. Install fenders to protect boat from rubbing against pier, pilings, and other boats. Lash down everything you cannot remove. Make sure batteries are charged and bilge pumps are in working order. If weather pattern is elevated to hurricane status all dock electrical and water is turned off within 12-hours of threat. All electrical cables to boats are to be disconnected from dock boxes or power pedestals. All brokered boats to be moved inside dry storage building and fuel dock secured and closed. All emergency pumps and generators are on standby. Marina staff on property at night. The Seminole County Emergency Operations Center (EOC) is the central command and coordination point for disaster response in Seminole County. The purpose of EOC is to provide a centralized and specialized location to communicate, organize and manage natural or manmade disasters and make strategic decisions necessary to protect the residents and property of Seminole County. Seminole County has few truly "north / south" and "east / west" road systems. The descriptions below refer to general movement in these direction, but would not stand up against a "compass check"! Interstate 4 will be the primary route for evacuees heading to the northeast (Daytona Beach and Jacksonville) and southwest (Lakeland and Tampa). The "Greenway", also know as State Road 417, is an alternate north/south route. Bridges connect the unincorporated community of Lake Monroe with Debary, and unincorporated Seminole County with Osteen, both of which are in Volusia County. These are alternate northbound routes across Lake Monroe to those who want to avoid Interstate 4. U.S. 17/92 is the secondary route moving traffic in these same directions. Where State Road 436 turns to a southerly direction in Casselberry, it too serves as an alternate southbound route into Orange County. In the Northern part of Seminole County, State Road 46 moves traffic westbound into Lake County and eastbound into Brevard County. State Road 434 carries traffic generally eastward into Oviedo where traffic can be redirected to State Road 419. State Road 436 moves traffic west to Lake County and East to Red Bug Lake Road in Casselberry, where evacuees can continue east bound to Oviedo and beyond. Public shelters open with what food and water is on hand. There is always the possibility that the water system may be interrupted. The original food could be used before additional supplies arrive. Those planning on using a public shelter should be prepared to take food and water with them. Plan on one gallon of water a day per person. 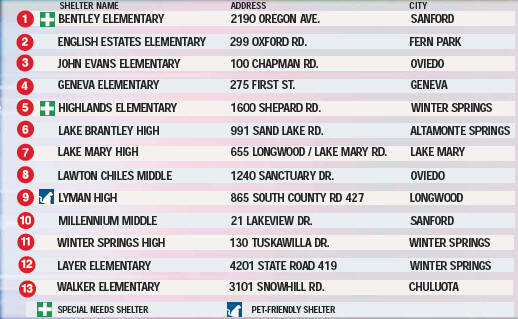 There are times when most or all shelters will be opened. For instance, if a coastal evacuation were ordered many if not all Seminole County public shelters would be opened to accommodate the arriving evacuees from other counties. Still, there could be some shelters that would not be opened for one reason or another. The Seminole County Division of Emergency Management will notify the public of which shelters will be used and when they will open. This will include the notification of the news media, the use of this Internet site. Among those organizations that will be notified are municipal government, public utilities, health care organizations and every department of county government. Once the storm has passed and if the marina is accessible, staff members will inspect for damages to all buildings, grounds, docks and utilities and report to the Plan Coordinator on any unsafe marina conditions. Emergency repairs are made if practical. 1. Plan Coordinator communicates safety report to EOC. Plan Coordinator announces official end of emergency. 1. Plan Coordinator issues additional special instructions including those of the City of Sanford and EOC. 2. All dock access ramps locked and secured. Major health and safety hazards remain even after a hurricane's wind and rain have passed. Injuries can happen to anyone dealing with the aftermath of a major storm, so it is wise to be overly cautious. Debris-filled docks are dangerous; therefore, walk with caution. Upon entering your boat, do not use open flame as a light source: Use a battery-operated flashlight. Wear protective clothing on legs, arms, feet, and hands while cleaning up debris. Wear rubber gloves while scrubbing flood damaged interiors and furniture. It is wise to be overly cautious and aware of electrical hazards. Watch for loose or dangling power lines, and report them immediately to the marina. Be sure electric is turned off before entering the boat for the first time. Disconnect main switch and all circuits. Watch for electrical shorts or live wires. When in doubt have an electrician check the system for short circuits. When inspecting a boat for hurricane damage, make sure there is no live power in or around the boat. Make doubly sure that main dock electrical breakers are off. Flooded boats should be pumped and inspected as soon as possible. Do not pump oily bilge water overboard. Use approved absorbing mats in the bilge before pumping to absorb the oil and/or fuel. After a major storm, you must assume that all water sources are contaminated until proven safe. Purify all water used for drinking, cooking, and washing, and for eating and cooking utensils. Also, purify the water used for washing hands, body, and kitchen and bathroom surfaces. Do not use water that has a dark color, an odor, or contains floating material. To disinfect water, one of four methods may be used: (1) boil at a rolling boil for 10 minutes; (2) add 8 drops of liquid chlorine bleach (such as Clorox) per gallon of water; (3) add 20 drops of two percent iodine per gallon of clear water, or 40 drops per gallon of cloudy water; (4) add water purification tablets according to directions on the package. These tablets can be bought at most drug and sporting goods stores. These solutions should be thoroughly mixed and the water allowed to stand for at least 30 minutes before using. To lessen the flat taste of boiled water, pour the water back and forth several times between two clean containers. When filing an insurance claim for hurricane damage to your boat, an insurance adjuster should be called immediately. Cleanup and salvage should begin as soon as possible. Do not wait for an adjuster; additional damage can be added when found. But do take photos BEFORE any cleanup for use as an inventory. Always keep damaged materials for proof of loss. Be sure to sign a proof loss statement. If looting should occur, report any theft to the police. Save receipts for reimbursement, including temporary lodging and food.